Kaiping has been a familiar sounding town name for me. It was one of the many nearby cities I learned the names of once I started telling people I was headed for Guangzhou. Previously many of my NZ-Chinese friends had claimed to hail from Guangzhou but soon as I asked some of them about good places to live they changed their answer to their real hometowns, the smaller satellite cities around Guangzhou: Foshan, Zhongshan, Kaiping etc. Kaiping is around 2 hours out of Guangzhou, with a different culture and recent history. And it's a gem of a little town to visit. Kaiping has only 600,000 people, straddles two rivers and is one of the towns comprising the Siyi region (literally "the four counties"). Their language is similar to Guangzhou Cantonese but it isn't mutually comprehensible (the locals learn Guangzhou cantonese as it's the lingua franca for the Guangdong and some of Guangxi, though). The Siyi region, historically, is famous for a lot of things. For some reason, this stretch of land produced a disproportionate number of people in the late 19th and early 20th centuries who search for their fortune abroad. Most commonly it was the gold mines of San Francisco but it's likely that a fair few headed for Otago as well. They left as single men with no dependents and, if they returned, they came back with their fortune to get married and have a family. But they didn't just bring money; they brought back western architectural ideas. They put a lot of that money into making "diaolou" style houses, often called "watchtowers" in English. During this time there was a lot of banditry in the countryside and these imposing taller buildings ostensibly were to protect. But most people can see a little bit of "keeping up with the Jones" about it - if one side of the town had one of these it obliged the other side to follow suit, if they could. People then gave their homes names, put in all sorts of roman domes and Arabian motifs. 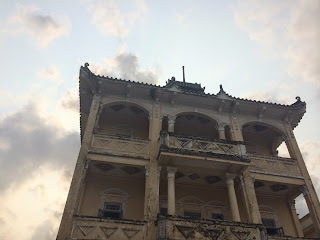 Whereas Macau and Shanghai have their western colonial period buildings, Kaiping colonized itself with a mishmash of extraordinarily foreign designs and ideas 100 years ago. One building that we could enter was complete with a sitdown toilet and bathtub on every level. And for the visitor that's where things start to get interesting. Any bus ride through the countryside results in glimpses through the trees of old, but very unchinese, buildings. Every building a new idea. Walking around. Perhaps even cycling around. Exploring backstreets has never been so much fun. 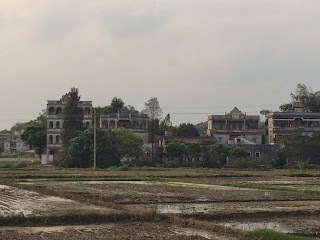 The visitor-unfriendly side is that people rarely go to Kaiping city itself to see the watchtowers (or go to spas), they'd either drive themselves there or take tours direct from the bigger cities like Guangzhou. After we got there we were appalled that it required a bit of work to figure out transport, which revolved around routine buses. What made up for this was the helpfulness of the people (almost the most helpful I'd seen in China). One guy who worked at the bus station walked us around the streets to different places to solve one of our problems, transportation to a spa. Once we figured out that complicated transportation we gave it a go and it went perfectly with the unexpected help of another fellow: We got off a bus at a town near the spa complex. We'd been told that we needed to catch a motorbike over to the spa but were a little unsure of how to do that. A man from a shop saw us and asked us where we were going. We explained and he whistled over a motorbike, grunted at the driver and he took us there. We took the driver's cellphone number and once we were finished at the spa, gave him a call to pick us up. It went like clockwork, which is always a good feeling when you're travelling. The watchtowers, the spas and our chief purpose, to attend the wedding banquet of a friend, were all wonderful. The watchtowers will stay in my mind for a while I think. Nowhere else in China did people go in such numbers abroad at that time. Nowhere else in China did they come back in this kind of style. Originally there were 3000 watchtowers in the region, with 1833 still standing.